Under the cover of darkness a small boy, Maki, loosens the shackles that bind him and escapes into the desert night. 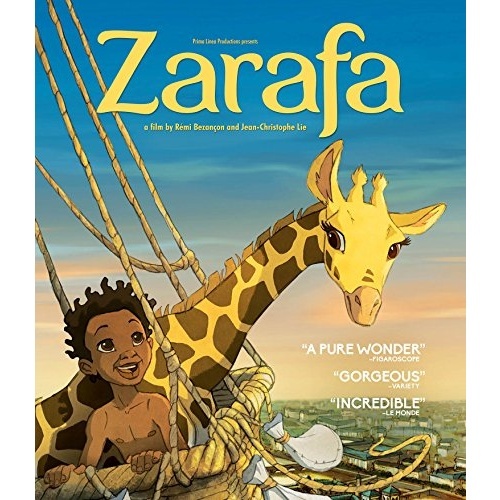 Pursued by slavers across the moon-lit savannah, Maki meets Zarafa, a baby giraffe and an orphan, just like him as well as the nomad Hassan, Prince of the Desert. Hassan takes them to Alexandria for an audience with the Pasha of Egypt, who orders him to deliver the exotic animal as a gift to King Charles of France. And so Maki, Zarafa and Hassan take off in a hot-air balloon to cross the Mediterranean, setting off an adventure across Northern Africa, the bustling port of Marseilles, and over the snow-capped peaks of the Alps, arriving at last in Paris. But all the while, Maki is determined to find a way to return Zarafa to her rightful home.